Enough of the digital talk. For this post, it’s time to get back to some serious guitar talk instead. 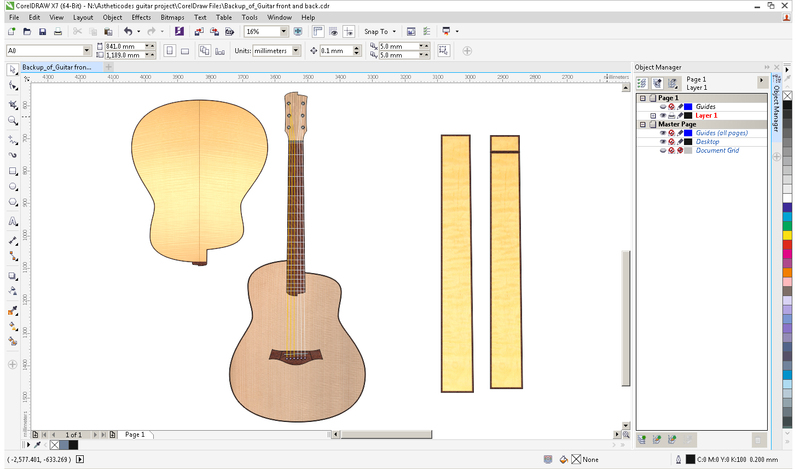 Guided by Nick, we’ve now come up with a design for the Carolan guitar. The body shape is broadly based on the popular Dreadnought (or ‘Dread’) style, a versatile style first created by C. F Martin and Company nearly one hundred years ago and named after the modern battleships of the time. In our case, we’ve extended both upper and lower bouts to make some extra space for aesthteticode patterning, leading to a slightly asymmetric shape. We’ve also opted for a small cutaway, both for the traditional musical reason of providing easier access to the upper reaches of the fretboard, but also to provide an extra hidden nook for decoration (don’t tell anyone else about this secret code location though!) . Perhaps the most distinctive features of our design are the sound holes. Inspired by our earlier tests, we plan to experiment with cutting a series of sound holes into the instrument that form part of its interactive decoration. Rather than a traditional central soundhole, our soundbroard will feature a series of smaller holes on the upper bouts, reminiscent of classic Ovation guitar designs. These will be complemented by an additional sound hole on the top side of the instrument, facing up towards the player so that they can better hear its voice for themselves. For the woods, we have chosen to work with flamed maple for the back and sides and spruce for the top. Not only are these beautiful and classic tonewoods, but we hope that their light colour will provide a strong contrast for etched aestheticode patterns and so improve reliability of scanning. Even a master craftsman working with traditional materials eventually succumbs to the lure of the digital, and Nick gets stuck into some Computer Aided Design using Coraldraw to incorporate these various features into a precise specification of the shape and dimensions for our guitar. The next stage will be to work out where to locate our aestheticode patterns and to figure out what kinds of interactive services they might actually trigger ….